I have previously pondered the variety of spellings of “Hummus” when I made my Sweet Potato Hummus. So let’s not dwell on that this time. But I’ve just found out that the word Hummus actually translates to “Chickpea”, so really it is an incomplete description regardless of how you spell it. A bit like calling Babaganoush just “Eggplant/Aubergine”. I’m still a fan of the Hummus, and today I tried a different twist. Instead of my usual Sweet Potato version I used roasted beetroot instead. The beetroot doesn’t hold as much moisture as the sweet potato so it needed a few tweaks but it turned out just lovely. Tasty AND so pretty! Just don’t spill it on the carpet. GF, DF, V, EF, NF. Makes loads. *I quartered the beetroot then wrapped it in foil to roast. You can roast it whole in its skin then it peels easily. However I quartered it to try and speed things up! It still took a good while to roast (bake until a skewer easily passes through it) so do the roasting when the oven is already on for another purpose. Place garlic and lemon zest in jug. Whizz 8 sec, Sp 8. Scrape down sides and repeat if there are any large pieces remaining. Add remaining ingredients. Whizz 30 seconds Speed 5, pausing half way to scrape down the sides. Depending on how soft your beetroot was you may need to whizz it a little longer for a smooth result. Tip: I find that chickpeas vary greatly in their moisture content. If your hummus seems a bit too stiff you can add a bit more oil, or a dash of boiled water, or even some liquid from the chickpeas. It’s a good idea to do this anyway if you are making the hummus a day in advance of serving and it tends to thicken up a bit over time. 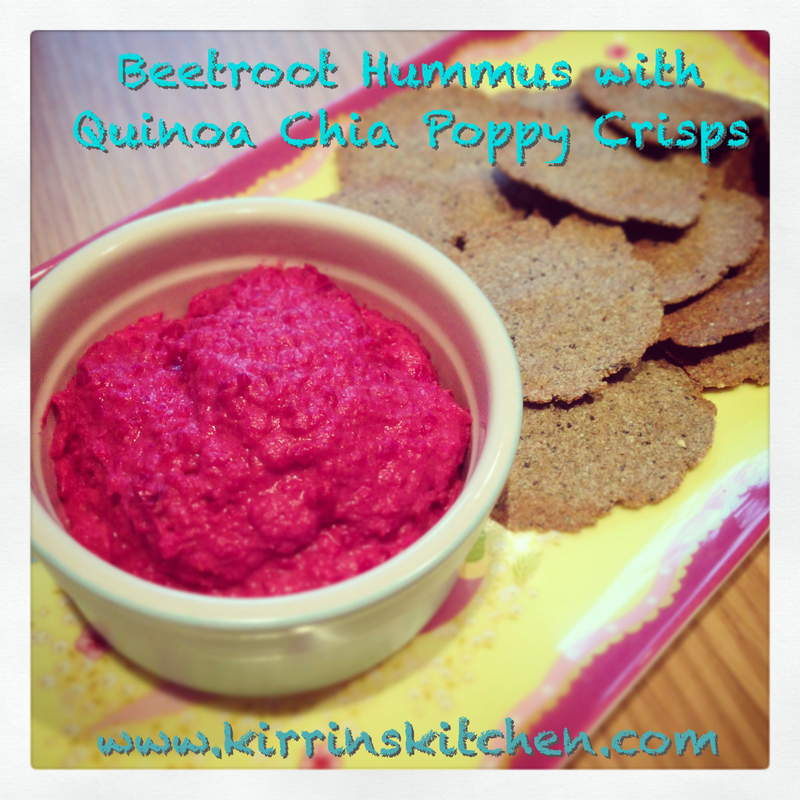 You can find the recipe for the Quinoa Chia Poppy Crackers here. This entry was posted in Treats & Snacks and tagged Beetroot, Chickpea, dairy free, Dip, gluten free, grain free, Healthy, Hommus, Houmous, Thermomix. Bookmark the permalink. OMG Kirrin – thank you so much for that recipe. My wife loves beetroot and this will be a great recipe to let people know about for the summer months ahead. Ooh what a great colour! Looks lovely, Kirrin! You might try adding 30 g of cooked rice to the mixture and blending at a slightly higher speed to get a smoother result. ThermoHubby John loves beetroot and also loves hummous (there’s another spelling for you) so it looks like this will be on our menu very soon. Thanks for sharing! I know! I can’t believe I only just discovered this. Hope you enjoy it.